Download AddDefragToDriveMenu Registry Hack from here[link2]. It’s a .zip file, extract it. You should find three files. Double click on AddDefragToDriveMenu.reg. A new box will popup, click ‘Yes’. Download context_defrag.zip from here and extract it. Double click on context_defrag.vbs to run it. 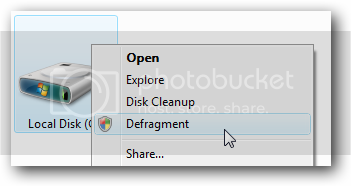 Now go to My Computer and right click on any drive, you should be able to see an option to Defrag in the menu.